I was intrigued to see the new food items rolled out this season at Sox Park, but was perturbed that once again, the team did not consult with me before making any decisions. Had the White Sox floated these ideas by me first, these would have been my notes. 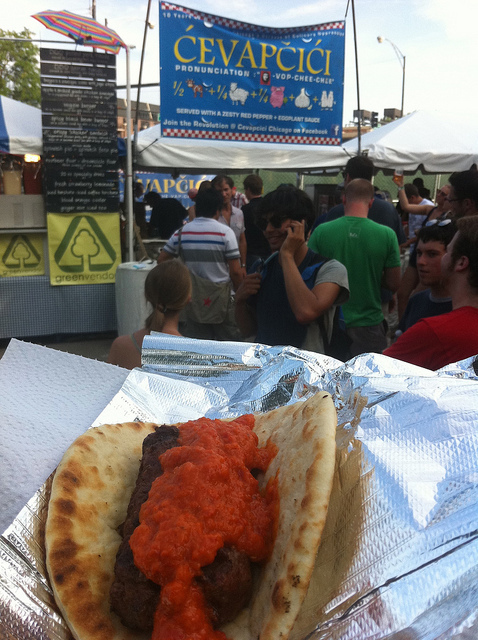 Balkan Dog, a casing-less combination of pork, beef and lamb, served with diced white onions and a zesty red pepper and eggplant sauce on pita bread. It is a well-loved favorite in Eastern Europe. I’m not sure about this one. It sounds delicious but also a little difficult to pronounce not to mention figure out why you’d get this instead of a hot dog or Polish or Italian sausage. Could we instead try rolling this out in meatball form and call them Balkan Bases on Balls? Burger Barn - Offering "DaBurger Double Play" and the "Juicy Lucy." DaBurger is a pork patty topped with cheddar, bacon, BBQ sauce and caramelized onions or with produce and your choice of condiments. The Juicy Lucy is stuffed with bacon and cheddar or jalapeno and cream cheese. This sounds like instant death, and also delicious. Owl&apos;s Nest - Chicken wings tossed in Hooters&apos; wing sauce. Your choice of medium, hot and honey Thai served with celery and choice of blue cheese or ranch dressing. Sure, people like wings, but is this really ballpark food? I’m picturing hot sauce smeared everywhere and chicken bones littering the ground. Can we make this boneless, and/or put it on some sort of a bun? Chicken Sandwich - All natural, free-range chicken breast grilled and served as a sandwich. Esteemed vendor Coleman Natural Foods provides chicken that has never been treated with hormones, antibiotics or preservatives. Zzzz. Not even a fun name? Like the Don COOPer sandwich? Irish Nacho Helmet - French fries topped with cheese, sour cream, bacon and chives. Served in a kelly green souvenir helmet. Here’s the thing about Nacho Helmets. The stadium needs to install special Helmet Washing Out Stations. There is way too much shredded lettuce and nacho cheese lingering in the drains of the ladies’ rooms. Bases Loaded Sundae - A funnel cake topped with three scoops of soft serve ice cream, loaded with chocolate, nuts and other toppings. Served in our famous Batterman souvenir helmet. Can we possibly fry this? DaBurger Triple Play - A pork patty topped with cheddar, bacon, pulled pork, BBQ sauce and caramelized onions. Asian Burger also available. Why is the Asian burger getting marginalized with no descriptor? And why isn’t it getting called Fukudomadness or something? Smashers - Handheld twist on the Panini, served with dipping sauces. This makes no sense. Handheld? How else is a panini served? Also, no offense but a panini seems a little bit North Side, if you know what I mean. The Sloppy Jane - Vegan twist to a classic favorite. Tempeh, peppers and onions, with molasses and brown sugar barbecue sauce, served on a vegan wheat bun. I see possibly ten of these getting sold throughout the entirety of the season, but nice idea anyway. Pierogi Triple Play. Why not? Chicago’s a Polish town and Bridgeport a historically Polish neighborhood. Kill the ice cream of the future. The future is here and it sure don’t look like tiny dots of ice cream. Let’s go back to the drawing board on this one. Arnold Palmers. Just a thought! A bucket of fried cheese curds. Look at the menu items above. Are we too proud for this or something?